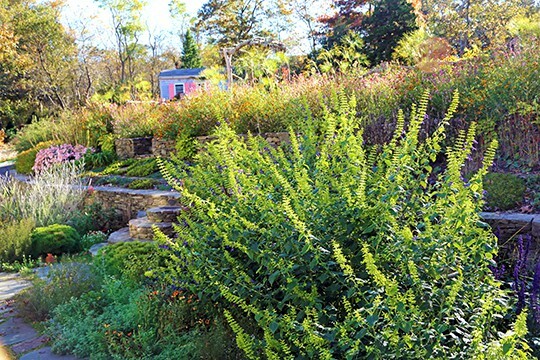 After seeing Salvia mexicana ‘Limelight’ in a garden a few years ago I knew I wanted to grow it even though it isn’t hardy on Cape Cod. So this past spring I ordered some from Digging Dog Nursery and planted them in late May. They sulked early in the season when it was cool at night but once it got sunny and hot this plant took off and grew to be six feet tall by September. The lime green calyxes, dark green foliage and bright blue flowers are outrageously striking and all the more so because the plant doesn’t flower until mid-September. 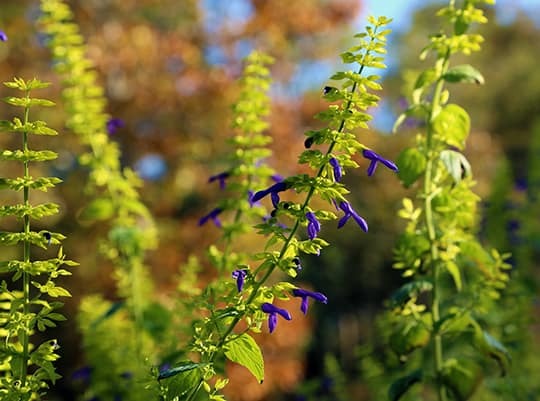 So just as the gardener is becoming resigned to things winding down, this Salvia stands up and shouts “Ta Da!” and you can’t help but cheer along with it. This may not be the plant for you if you get a hard frost before September 15th. But if freezing temperatures hold off until late October, get this Salvia to use in bouquets with Dahlias. Plant it for the classy combination of lime green and bright blue. Plant it for a final celebration of the end of summer. Large, dramatic, and exuberant color as a last hurrah.